The Lucombe Oak is a natural hybrid between the Turkey Oak and the Cork Oak, discovered in 1765 by William Lucombe who propagated the tree in large numbers by grafting on to Turkey Oak stock. 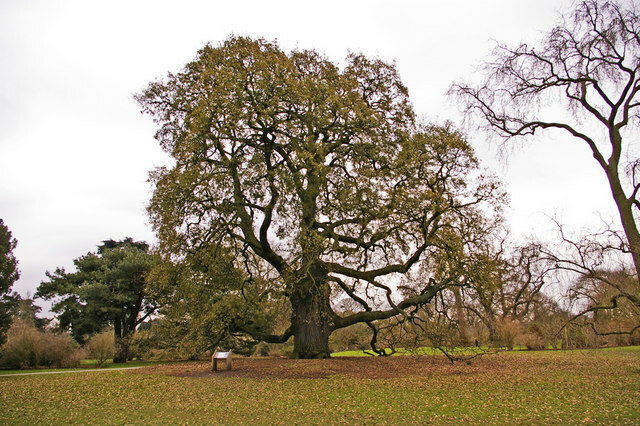 This tree is believed to be one of an original batch of seedlings and was planted in Kew in the late 18th century. Some 70 years later in 1846 the tree was moved some 20 metres - a mammoth task. This tree is also semi-deciduous in that it only drops its leaves in the spring when the new ones grow. This page has been viewed about 1014 times.